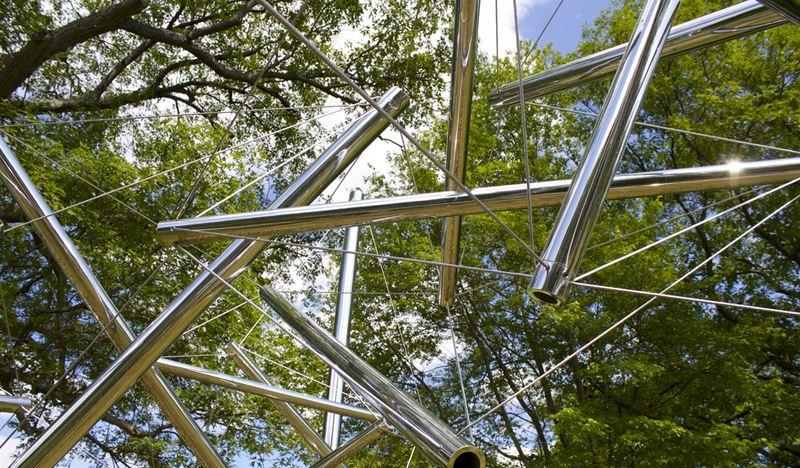 Consisting of an angular matrix of polished stainless steel tubes joined by wire cables, the sculpture Mozart III communicates the music and “poetry” associated with its namesake. On a recent sunny day, Jennifer Lyon-Mackie ‘18, a student assistant in the public affairs office, captured this photo of the sculpture with sunlight streaming through. Mozart III is a work by internationally renowned sculptor Kenneth Snelson. On his website, Snelson describes his work as being concerned “with nature in its primary aspect [and] the patterns of physical forces in three dimensional space.” His sculptures often center around the concept of “floating compression”— what Buckminster Fuller called “tensegrity,” a gravity-independent system of push-pull forces that exist in dynamic equilibrium. The piece, which stands 24 by 24 by 30 feet, is located near the Science Center and is visible from College Road. A gift from Lynn Dixon Johnston ’64 and Robert F. Johnston, it was first installed in July 2008. The Johnstons made the gift permanent in 2012. They also donated a Clement Meadmore sculpture, Upsurge, which is installed between the Davis Parking Structure and Diana Chapman Walsh Alumnae Hall.